Coming into the historic first ever Stadium Series hockey game at Yankee Stadium, New Jersey Devils head coach Peter DeBoer had not committed on a starting goaltender due to how well goalies Martin Brodeur and Cory Schneider have played recently. Schneider was coming off a 2-1 victory over the Capitals on Friday night, but after that game DeBoer still needed a night to pick his goalie. DeBoer went with sentimental pick, Brodeur due to his importance to the Devils organization. Brodeur allowed five unanswered goals before being pulled before the start of the third period and the New York Rangers went on to rout the Devils 7-3 in front of 55,105. Mats Zuccarello scored twice including the tie breaking and go ahead goals to pace the Rangers as five different players had two points on the afternoon. Derek Stepan capped the scoring off in the third period as he scored on a penalty shot off of Cory Schneider. Perhaps the most important part of the outcome is that the win put the Rangers four points ahead of the Devils in the Eastern Conference playoff race. 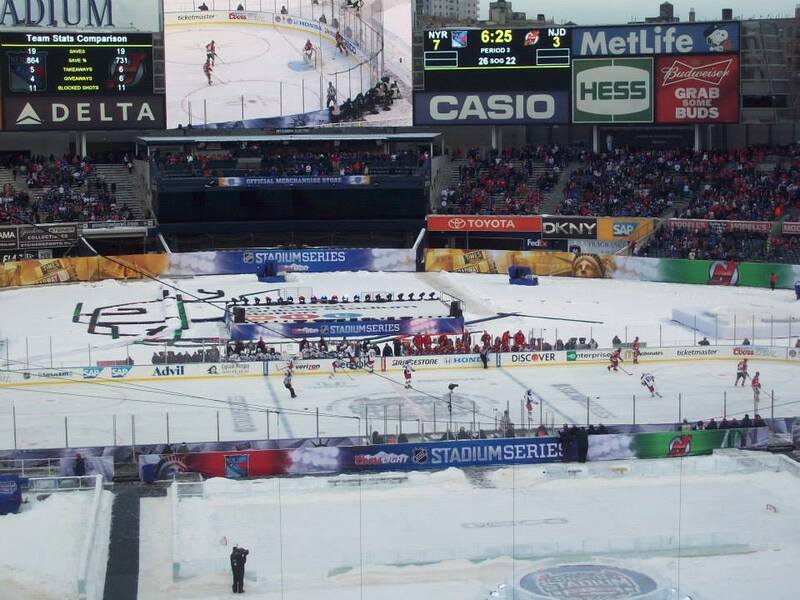 The game, which featured snow fall during the second period, was the first of two this week at Yankee Stadium. The start of the game was delayed due to a bright sun glare on the ice, but when it got started the crowd was into it. “I felt like our team had everything under control in the first ten to fifteen minutes. We had a 3-1 lead and just stopped playing our game,” said Jaromir Jagr after the game. Jagr had two assists on the afternoon to pass Mario Lemieux and move into sole possession of ninth place on the NHL’s all-time assists list. “I don’t feel like going anywhere. I enjoy the game. I want to keep playing so I don’t worry about the numbers,” said Jagr when asked if he knows his place in game. “The game was 3-2 after the 1st, we felt like we had the game under control and in the 2nd we were a whole different team unfortunately,” Elias added. The Devils need to play a full sixty minutes of hockey every game if they hope to make the playoffs. Meanwhile the Rangers will look to continue their winning ways when they host their rival The New York Islanders Wednesday night in the final Stadium Series game of the season at Yankee Stadium.